Gabal Hagar El Zarqa (Arabic: جَـبَـل حَـجَـر الـزَّرْقَـاء‎, translit. Jabal Ḥajar az-Zarqā’) is the highest point in Bir Tawil, an unclaimed area in the Nubian desert between Egypt and Sudan in Northeast Africa. 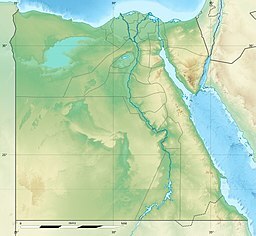 Due to a long-standing disagreement over the location of that border, its jurisdiction is unclear; it is said by the National Geospatial-Intelligence Agency to be in Egypt. In December 2017 British mountaineer Ginge Fullen accompanied by a local guide summited a point 400 m (1,300 ft) to the east of the waypoint listed on the right, recording a height of 716 m (2,349 ft) at N21 53'01 E33 58'13. ^ "Jabal hajar az zarqa'". Tageo.com. Retrieved 2018-04-08. ^ Mahir, M. "J is for Jebel Hagar – Christmas in No Man's Land". Sahara_overland.com. Retrieved 2018-04-08. ^ "Jebel Hagar ez Zarqa: Egypt". Geographical Names. 8 December 1993. Retrieved 24 December 2013. This page was last edited on 8 April 2018, at 06:05 (UTC).